Today, dear readers, is one of the more shorter reports from our trip. Why? Because of the rain, and we did let it rain on our parade I’m afraid. Today was a day of getting up late, messing about in the pool, having lunch and doing some shopping, before retreating to the villa to watch telly and go to bed. My diary tells me that we awoke to rain, my photos tell me that we were in the swimming pool in the morning, so somewhere between waking up and going out, it didn’t rain, as the photos show me it was very sunny! 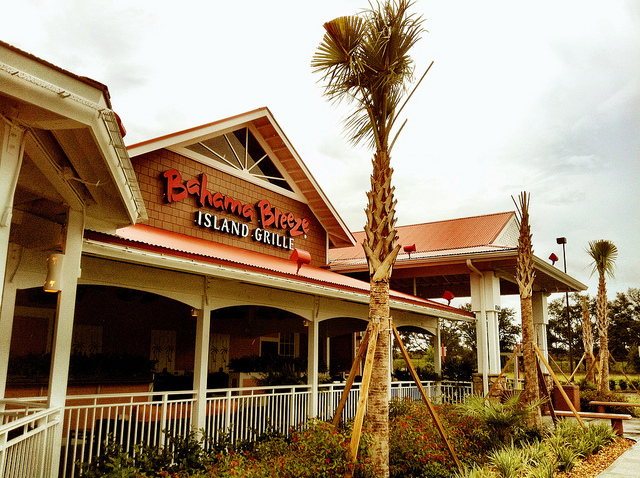 By the time it came to go out however, it had got surprisingly dull, so, to grab some sunshine, we decided to head towards Bahama Breeze Island Grille. Having read that it was a nice place to eat at, and since it was on our list of restaurants to visit, we drove the short distance to the one nearest to us on the 192 and parked up. We got to Bahama Breeze at around 12ish and ventured inside. We were shown a table and introduced to our waiter who was very friendly and accommodating. I was guessing more so than normal, owing to the fact that, at that time, we were the only customers! With the bill paid, we came out to the rain still pouring. Seeing that a Super Target was next door, we decided to pop in for a spot of shopping. It was HUGE in there. Some groceries (didn’t feel as many as Walmart or Publix though) including an end of aisle display of ‘Fine British Foods’. We didn’t feel the need to buy – I’m in America – I want American stuffs!!! After a wander through the rest of the store (which sold clothes, electricals books, craft/stationery items, homewares and Disney stuff) and picking up some bits and bobs, we set the sat-nav to take us to Michaels at Posner Park, which, when I looked it up on Google maps back in the UK, saw it wasn’t too far from our villa. Homer though had other plans, and decided to take us the long way round as it seemed to take forever. Michaels, for those that don’t know, is like a Hobbycraft. From my American friends, I know that this is a wonderful place if you are a crafty type person and it was on my list of shops to go to. When I stepped in, it was like I’d died and gone to Halloween heaven!! I was delighted to see so much Halloween stuff out for sale, and like a kid in a candy store was picking everything up saying “oh, I want this!” and “oooh, this is too cute!” and “OMG, I need that!” and “do you think this will fit in our suitcase?”!!! Anything with a pumpkin, in my eyes, is cute! This pumpkin light wasn’t going to fit in our case..I would have bought it, believe me! …but so much stuff would fit in our case, including the cute little witch from the display below. Every time I look at this photo – even a year (plus!) on, I wish i had bought the complete set! By now, it was very late after, and with the weather dampening our spirits, we just drove back to the villa. The rain continued into the night, so we just watched TV and went to bed, ready for Seaworld in the morning!